I first came across Concept Maps at a conference – see this post highlights #3. Although I have been analysing and modelling data for a long time, this was new to me, as a more informal way to understand and link concepts, clarify meanings, and create a map of domain-specific knowledge. 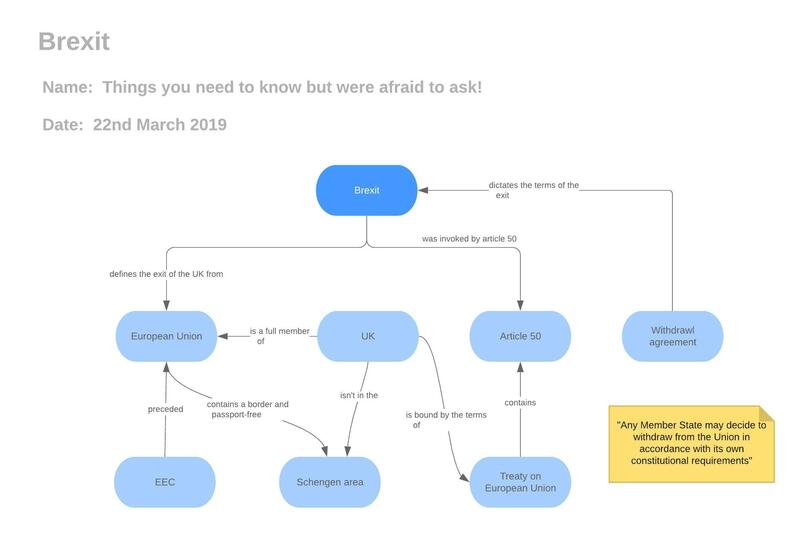 I have used a LucidChart free licence to draw and export the examples maps below. … represent knowledge and can help to visualise relationships between various ideas and terms to test understanding of complex subjects. The notation is deliberately simple, typically labelled boxes or ovals for each concept and connections between the nodes, both in natural language. The linking lines can have arrows to show the direction in which the association can be read. 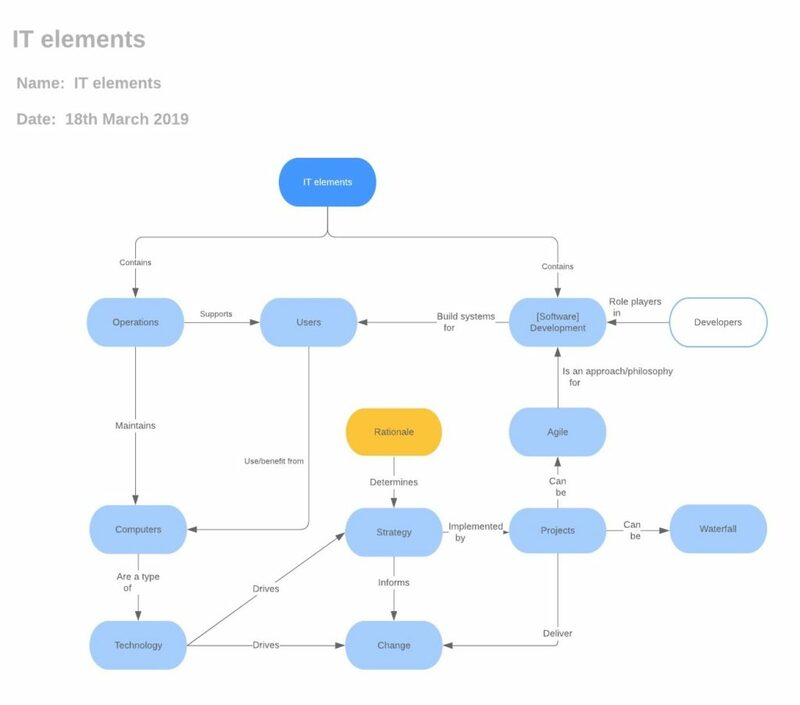 For example, from the sample map below, ‘IT elements contains Operations’ and ‘Agile is a philosophy for software Development’. That’s it in it’s simplest form, there is no more jargon or complicated rules. The very act of capturing and understanding concepts and associations provides the learning and a static model to be shared and revised, as necessary. Below is a little exercise I did to link a few topics from the table of IT elements as you. As I expected there are many and various ways to navigate around the model, and I also added a new element Developers and borrowed Rationale from the golden group for some added colour. Concept mapping is not mind mapping in that it doesn’t (necessarily) have a single central concept or theme. More importantly it doesn’t lend itself to the creative use of colours, icons, and different line thicknesses radiating out from the centre. Concept mapping is not data modelling in that it is not intended as a complete model of the domain nor is it as rigorous. You can mix and match terms that are not of the same type, i.e. heterogeneous – see the second example below. Also, data analysis and logical data modelling normally has some other purpose in mind, such as designing a physical database solution, drilling down into more detail, i.e. specific data items within a node (Object/Class/Entity), improving management information (MI) or business reporting etc. … organise business vocabulary needed to consistently and thoroughly communicate the knowledge of the domain. It recommends starting with a glossary, i.e. not a blank piece of paper, and focus on core noun concepts (the nodes) and verb concepts (the connections). It also suggests that other types of connection can be used to help to categorise and classify information, also to recognise whole/part relationships etc. – this is beyond the scope of this introductory guide. The notation works for a more fluid abstract topic, i.e. a mixture of nouns and proper nouns, single or plural terms etc. Some other document, for example in a glossary, is needed to hold supporting material, descriptions, rules, lists etc. If you have any questions or comments about Concept Maps or this series as a whole, please email the Lab at the IT elementary school. © 2019 IT elementary school Ltd.